This elegant 14K white gold wedding band features a chandelier design of a central fleur de lis flanked by abstract floral figures. 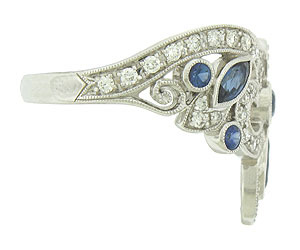 The romantic cutwork is set with both round and tear shaped sapphires. 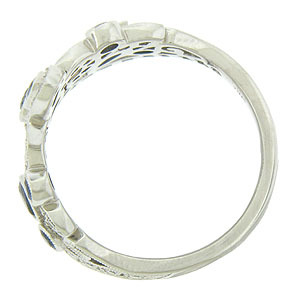 Fine faceted diamonds adorn the curling edges of the band. 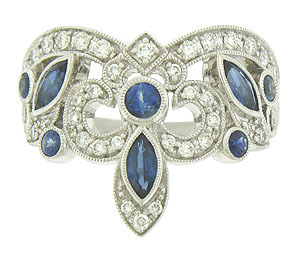 The intricate design is outlined in delicate milgrain decoration. 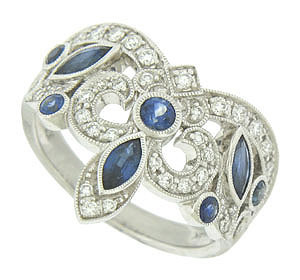 The antique style ring measures 15.49 mm in width. Size 6 3/4. We can re-size.